Sign up and instantly receive a savings voucher. By submitting you give permission to use your personal information to receive product and disease-state informations from KVK Tech, Inc., its affiliates, service providers, and co-promotion partners. You may revoke your permission at any time. You must be 18 years or older. To download and print your Lomaira Lo-Cost Access Program card now, complete the following and submit. For questions, please call 1-844-LOMAIRA (566-2472). For processing questions, please call 1-855-531-1071. Phone lines are open 24 hours/day, 7 days/week. Lomaira™ (phentermine hydrochloride USP) 8 mg tablets, CIV is priced to ensure that cost does not create a hurdle for patients. The Lomaira Lo-Cost Access Program was created to absorb any markups from parties along the supply chain and ensure that the low cost stays low cost even when it leaves KVK’s hands. With the Lomaira Lo-Cost Access Program, eligible patients will pay no more than 50¢ per tablet for the duration of treatment. 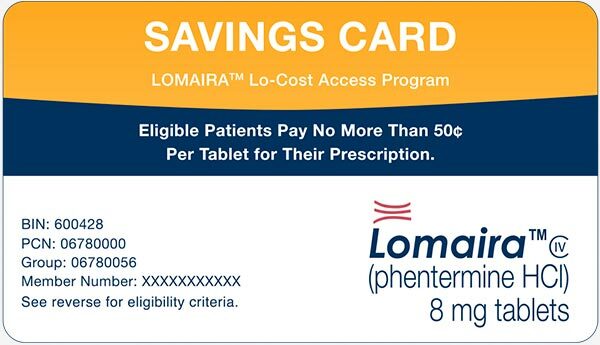 The Lomaira Lo-Cost Access Program savings card is good towards the purchase of a prescription for Lomaira. No substitutions permitted. Minimum 30 tablets. Most pharmacies accept the savings card. Patients must reside in the United States, Washington D.C., Puerto Rico, Virgin Islands, or Guam. However, Medicare Part D patients may use this card if paying the full cash price for a prescription covered by this card and no claim is submitted to Medicare or any other federal, state, or other governmental program. Out-of-pocket expenses incurred using this card cannot be applied towards Medicare Part D true out-of-pocket (TrOOP) expenses. Not valid for prescriptions for Lomaira reimbursed in full by any third-party payer. Patient is responsible for reporting receipt of program benefit to any insurer, health plan, or other third party who pays for or reimburses any part of the prescription filled, as may be required. May not be combined with any other coupon, discount, prescription savings card, free trial, or other offer. Void where prohibited by law, taxed, or restricted. Federal law prohibits the selling, purchasing, trading, or counterfeiting of this savings card. KVK Tech, Inc. reserves the right to rescind, revoke, or amend this offer without notice at any time. Other restrictions may apply.